Before hammering in the For Sale sign, home sellers need to do a bit of research to determine whether or not they should sell their home. To get help selling your home start with these online tools and apps. From mortgage penalties, to paying off the mortgage debt faster, to closing costs to possible appreciation value, to decorating tips, these apps and online tools are a good starting point. Claim: Moving and need to break your mortgage or want to get a better rate through refinancing? Calculate what it will cost you to break your mortgage. 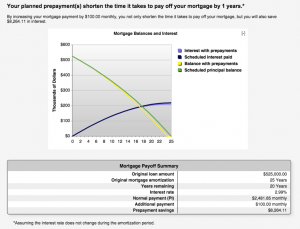 Pros: The calculator not only calculates the anticipated mortgage penalty, but also compares what you would pay (and save) with a new, current mortgage rate. It gives you all this information as well as a definitive answer on whether or not you should proceed. This calculator will help you with the preliminary numbers you need to consider when factoring in whether or not to break a mortgage. But treat this calculator as a first-step. Before actually making the move, contact your lender for a more precise calculation. Cons: The calculator is nice and simple, but it doesn’t let you input more details about your current mortgage. Plus, I found the penalty calculation was way off—by almost $15,000. How quickly can I pay off my mortgage? Claim: How much interest can you save by increasing your mortgage payment? This financial calculator helps you find out. Pros: If you’re tackling your mortgage debt and want the best strategy for paying it off, this calculator will give you a quick, easy snapshot of how much interest you save and how much sooner you’ll be debt-free. You can also try Ross’ mortgage strategy calculator, a tool that examines the best option between annual prepayments and monthly mortgage payment increases. Cons: While this a great tool to find out how best to prepay your mortgage debt, it doesn’t allow you to increase or decrease mortgage rates over time. 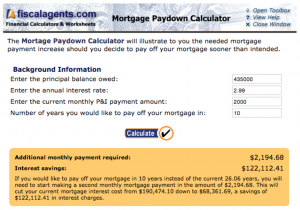 Claim: The Mortgage Paydown Calculator illustrates what mortgage payment increase you need to make in order to pay off your mortgage sooner than intended. Pros: Simple! Input the current mortgage debt, your mortgage rate and your current monthly mortgage payments and then decide when you’d like to be debt free. The calculator will give you the extra monthly amount required to meet your goal. Even better, it clearly tells you how much you save in interest payments. Cons: It only provides the additional monthly payment required to meet your mortgage-free goal, but you can use this to calculate the annual lump-sum payment that should help you achieve the same goal. Also, the calculator limits you from playing around with the different types of prepayments and doesn’t allow for changes in mortgage rates over time. 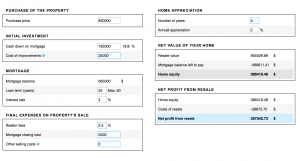 Note: For an Excel version of a similar calculator, consider Vertex 42’s free Excel spreadsheet that helps you analyze different aspects of your mortgage, including prepayments. Download it of the Vertex42.com website. Claim: This easy calculator can help you quickly check your take on a deal and/or how much you can still receive from a FSBO willing to co-operate (signing a fee agreement) if you have a qualified buyer. This tool tells you exactly how much you need to pay your listing realtor and the buyer’s realtor, including tax. Pros: This tool tells you exactly how much you need to pay your listing realtor and the buyer’s realtor, including tax. What’s great is that it lets you input separate commission rates for listing and buyer agents, plus you can alter the sales tax that’s charged (to reflect the province you live in). Cons: One big drawback is that the commission options go up in 0.5% increments, rather than 25 basis points. Claim: Determine the commission paid to B.C. realtors. Pros: Selling your home in British Columbia? 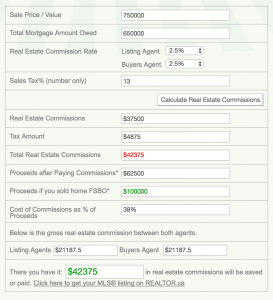 Use this tool to calculate the commission paid to both your listing realtor as well as to the buyer’s realtor. The calculator also adds in the GST owed on both. Cons: Limited to the B.C. market, but that’s partly because standard commission rates can differ from province to province. Also, the “seller receives” portion is a bit misleading as it doesn’t take into consideration payment of remaining mortgage, legal fees and additional closing costs. How much did my home appreciate? Claim: You can evaluate your future house equity by using an appreciation rate on your property’s value, and compare its final value with the future mortgage balance that will be left to be paid. Pros: Want to know what your home will be worth down the road and, more importantly, how much profit you’ll profit if you were to sell it at that time? This is the calculator for you. By changing inputs, including mortgage rates, realtor fees and closing costs, you can get derive a pretty good guesstimate on what your home would be worth when you sell. Cons: This is an American tool, which means the “mortgage term” input is actually the amortization of your mortgage. Keep in mind, too, that the answers you get will be highly dependent on how conservative or liberal you are with your input, and if nothing else impacts the housing market in your community from now until the time you sell. Claim: A zillion things home across all styles and budgets plus 5,000 brands of furniture, lighting, cookware, and more. Free shipping on most items. Cons: As anyone who has shopped online knows, sometimes the picture just doesn’t accurately represent a product. 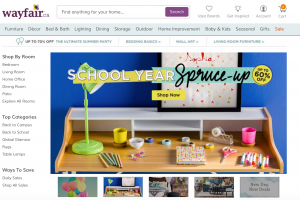 While this is a detractor for all online shopping experiences, Wayfair does try and alleviate any stress by providing free returns and credits of the product is shipped back within 30 days. Claim: We are a platform for home remodeling and design, bringing homeowners and home professionals together in a uniquely visual community. Pros: If you want to decorate, you start at Houzz. With tons of photos from all over the world, you can narrow down your next decor inspiration by creating idea boards. Then scan the pics for items and merchandise sold directly through the Houzz.com shop. 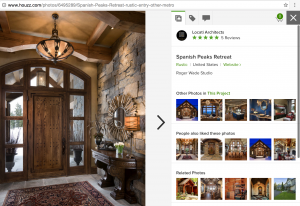 Even better, take a picture of your room or use another photo in the Houzz collection and add in merchandise to see how all the pieces fit together. Cons: While I love Houzz—and start all my decor idea searching on this site—I haven’t yet bought a product from the shop. One big drawback is all prices are in U.S. dollars. To buy any product not only do I have to factor in a poor exchange rate but also the possibility of paying customs and duty. Claim: CURATE is a mobile tool that allows the user to virtually see any artwork, scaled correctly, on their own walls. Pros: Put up your hand if you’ve ever stared at painting in a store, or squinted at a picture on your tablet, trying to imagine how it would look in your space? Now, instead of guessing, you can see how the art piece will look before bringing it home. 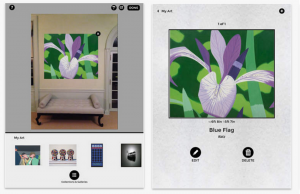 This app allows you to virtually display the piece—simply upload a photo of any blank wall. Plus, you can use the app to browse pieces from your favourite artists and galleries. Cons: There is no zoom function, but overall an excellent app. Claim: Design your dream home in 3-D.
Pros: Do you like to have a room design completed and done before spending one dime on decor? 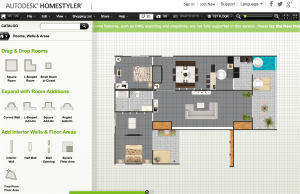 Then you’ll love Autodesk Homestyler. You can choose from pre-loaded room designs, or design your own. Or get the app on your phone or tablet and you can take a photo of the room you are redecorating and the app will let you place furniture and decor so you can see what your proposed design plan will look like. Cons: The mobile photo feature is great as long as you have a standard sized room without too many unusual or intricate features. But try it with an atypical room and the app has difficulty aligning the picture, which makes the placement of decor on the picture always a bit off. If you opt to use the design-your-own-floor-plan feature, be patient as you master the basics of the program. Claim: Capture color inspiration on the go with ColorSnap Visualizer, only from Sherwin-Williams. 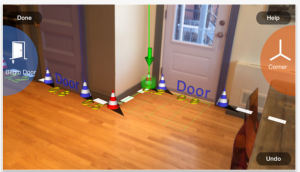 The new ColorSnap Visualizer easily matches the images you take with your iPhone to Sherwin-Williams paints, and helps you quickly locate any colour inside our stores. Get ready to make your best colour decisions yet with ColorSnap. Pros: If you need a colour swatch on the go—and let’s be real, at some point we all have—then this app will do it, and more. 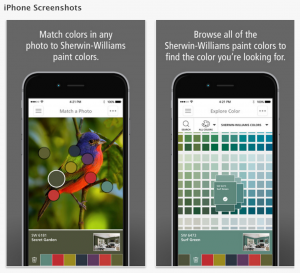 If you just adore a colour, then take a photo with your iPhone and ColorSnap will automatically find a corresponding Sherwin Williams colour and code. Cons: Only available for Apple products. Claim: MagicPlan quickly creates professional floor plans and work estimates. It measures rooms and draws floor plans just by taking pictures. Simply add objects, annotations, photos and attributes to generate reports or complete estimates. Pros: Want to get square footage and room measurements so you can accurately order home decor? Consider using MagicPlan. By taking a photo, the app is able to calculate distances and measurements. Add in annotations, and you can get a pretty accurate floor plan. Cons: The app does take a bit of playing around to figure out how things work.